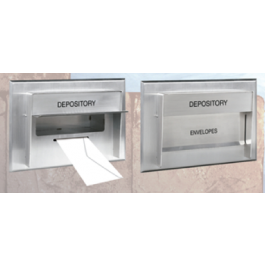 Built-in night light makes this envelope depository practical for any after-hours application plus, stainless-steel construction makes this unit virtually maintenance free. Conveniently drop envelopes, rent checks or utility bills in this after hours outdoor deposit safe. Ideal for banks, credit unions, walk up or drive thru lanes.